This week I am joined by Naomi who blogs at Me Becoming Mum on Other Bloggers Family Lives. 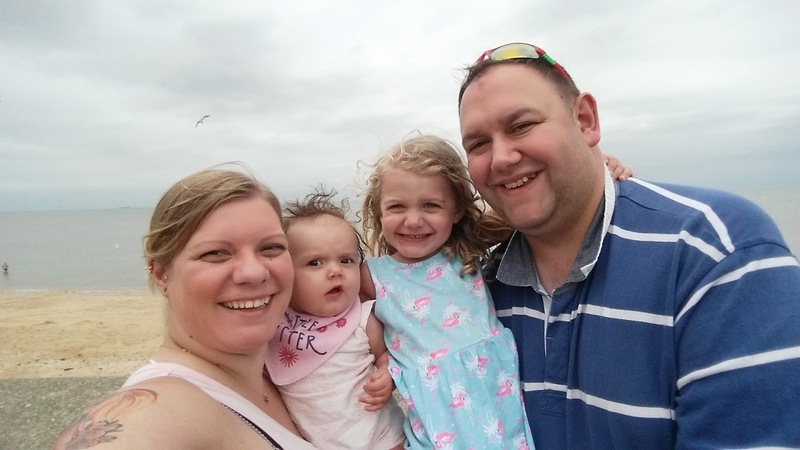 Naomi has a family blog all about life with her two little girls and family lifestyle topics. So let's find out more about the family behind Me Becoming Mum. Hi, I'm Naomi and I blog at Me Becoming Mum. I like to write honest posts, keeping it real about the truths and realities of my life from pregnancy and parenthood, to being a wife and running my own business. I am 26 years old and I love to read, write, crochet and bake. When I have time I also enjoy a bit of crafty extras, from scrapbooking to sewing. I married the love of my life six years ago, in the wedding of my dreams and we now have two beautiful children who are three and almost one (her birthday is in December). We started our lives together in Egham not far from Windsor. After having our eldest daughter my husband got the opportunity to move for his job, the prospect of which offered us a better life as a family. Now we live in Peterborough and we love it here. We are really lucky to have a massive park near us called Nene Park, which has a number of beautiful woodland and park areas which we can visit. Our favourite of these is called Ferry Meadows, which comes complete with a lake where you can feed the ducks and a few different playgrounds that our girls love to explore and enjoy. We try and go once a week as a family, although now it is getting colder we don't go as often. I would love to live in Scotland. My Mum's family are there and we always have an amazing time when we visit. There is so much to do and see there, with beautiful wild countryside to explore as well as plenty of places where you can get your shopping fixes (good ol' Primark, for example, is around and about all over). My husband's ideal would be that we go and live slightly off-grid up there, growing our own food and raising a few animals. For now, though that is a dream! I was born in Great Barr in Birmingham and when I was young we moved down south to Burnham, close to Slough and Windsor. My husband grew up in Egham, just the other side of Windsor. All of these areas are a minimum of two hours from where we live, so we are a long way from 'home'. 6.) What are your favourite childhood memories of where you grew up? I have so many lovely memories of the Midlands, as we have friends and family still there. We spent a lot of time visiting them. My main memories are from Berkshire, however, and I think my favourite ones are of the times that my family and a couple of others who had children my siblings and my age, spent at a local farm called Odds Farm. We grew up having such fun together, the eldest daughter from one of the families is still one of my closet friends today and the godmother to our youngest daughter. 7.) Have you got any exciting family plans for the year ahead? The rest of 2017 is chocked full of fun for us. We have our youngest daughter's first birthday to celebrate in December and of course Christmas, which is a really big deal for us. Next year we plan to take a trip to Scotland to visit the family I have there. It will be the first time we have seen most of them since our eldest daughter was one (she will be four when we go) and we will have another one year old in tow this time! 8.) What is your favourite thing about family life? I absolutely love being a mum. There are so many things about it that I could name but I think the biggest for me is the interaction I see between my girls. Apart from the odd tiff (which is usually because one, the other or both are tired), they are the best of friends and even with almost three years between them they play so nicely together. Sometimes I catch a glimpse of the way they look at each other and it melts my heart every time. Thank you so much for taking the time to answer these questions, Naomi, I hope that your daughter has a wonderful first birthday and you all have a lovely Christmas. I too love Scotland and would probably move there if I ever moved away from the North East.